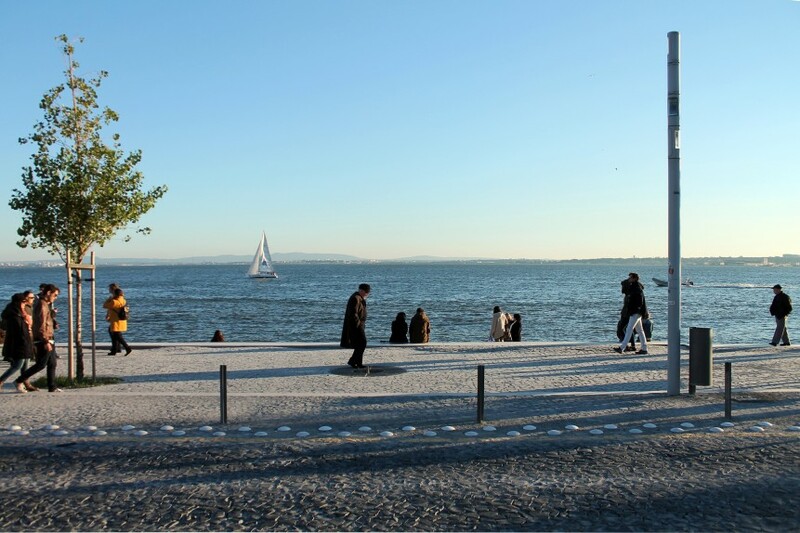 Ribeira das Naus is a mythical space in the national and local identity, partly produced by the collective imaginary, partly by official culture. The myth is rooted on the shipyard that in facto operated in this place, and which had produced over century vessels of various types. 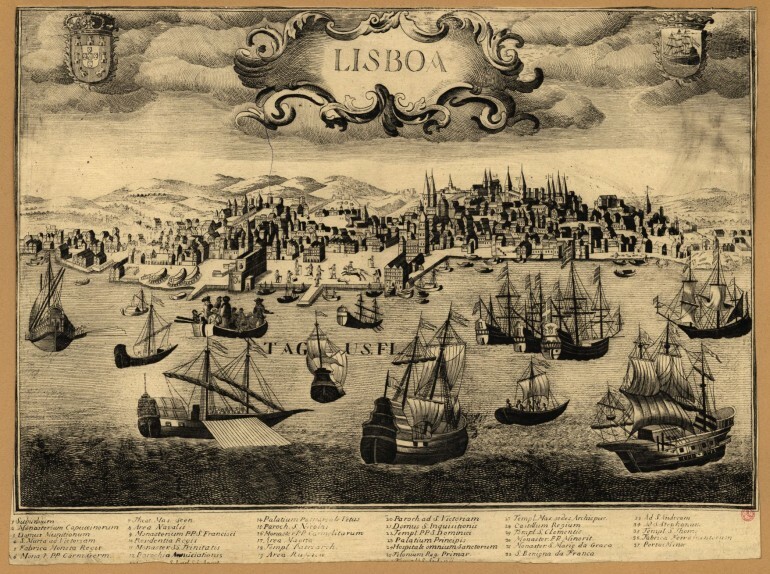 The myth articulates the certainty of the production of Naus (Ships) with the possibility that they might have been protagonists of the movement of discovery of universal routes, and with a first phenomenon of globalization driven by Portugal. 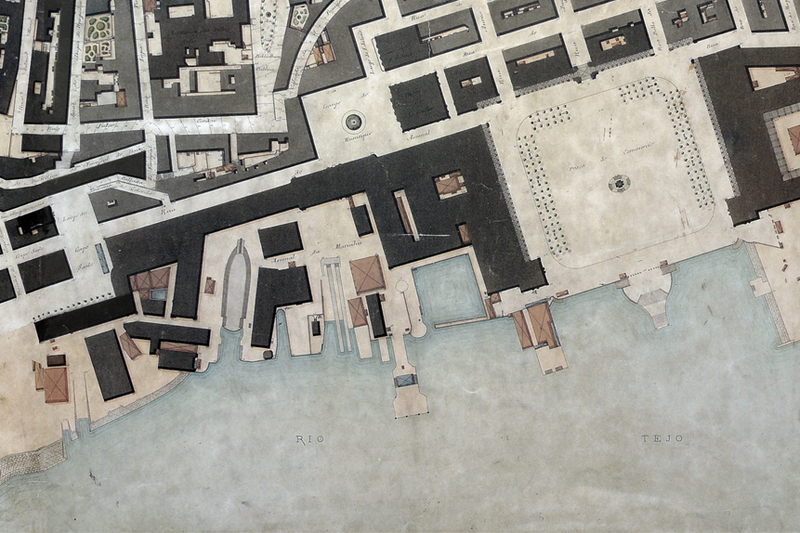 From a practical place of labouring to a mythic space of relation with a distant universe, both global and universal, Ribeira das Naus is a space always articulated in space with another brother space always related to the representation of power: the Terreiro do Paço square, today named Praça do Comércio. 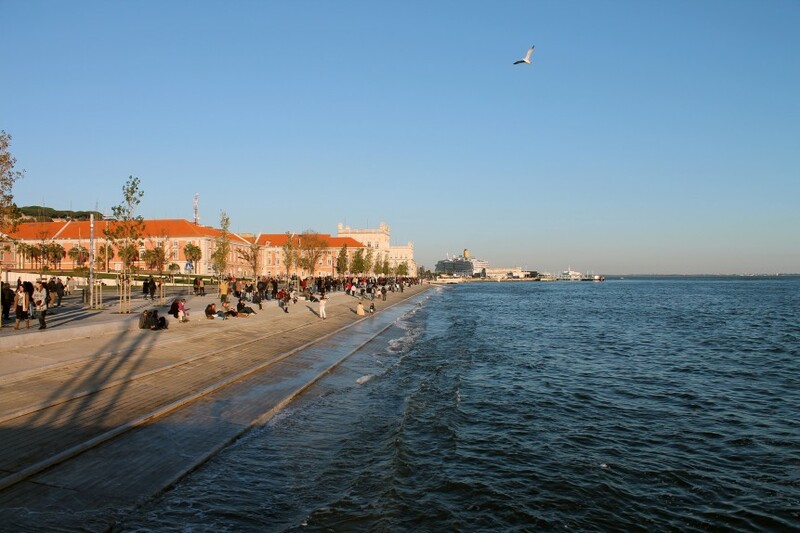 A powerful and devastating set of natural phenomenon partially destroyed the city, totally affecting the Lisbon Ribeira (waterfront) as a place. 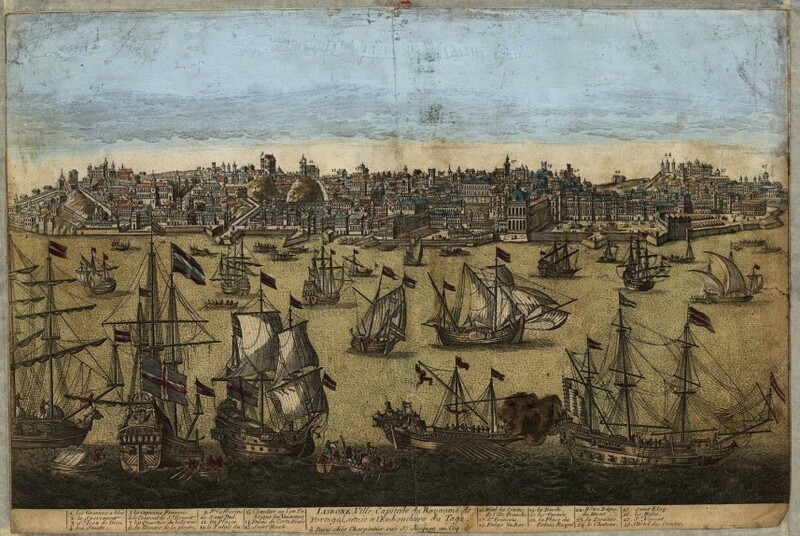 Its reconstruction curiously kept both the calling and setting of some elements like the arsenal dock, the beaching ramps or the dry docks. Place/Local and Local/Global simultaneously. But where is today the complex character we discuss behind? What is the significance of the current configuration of this place? 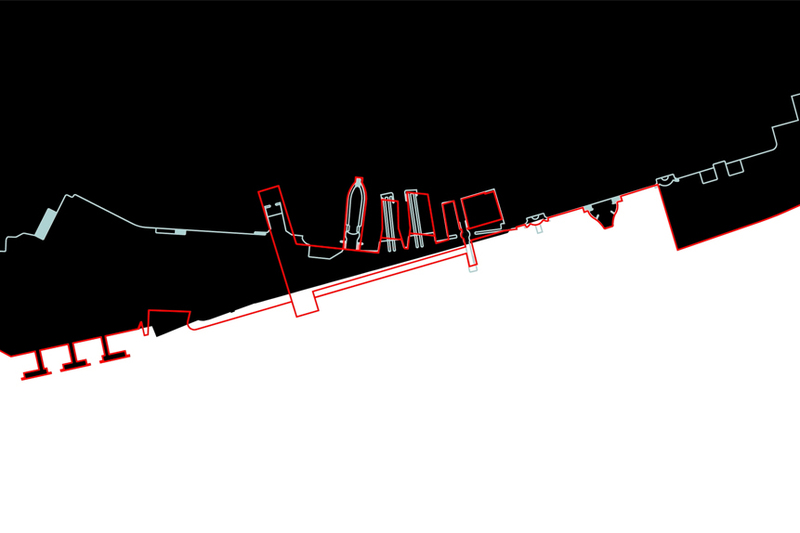 And what other elements, now invisible, could we call out and refocus on the shape and experience of this place? Stratification as a concept originated by tectonic geology helps us understand how the City successively reconstructs on itself. Sometimes it preserves seemingly inexplicably preceding forms, that only from the revelation of a greater extent become understandable. At the Ribeira das Naus we now have signs of different times: some directly experiencible, others only present by the abundant iconography and cartography that make them intelligible, and by the occasional revelations in each infrastructure or facility excavation. 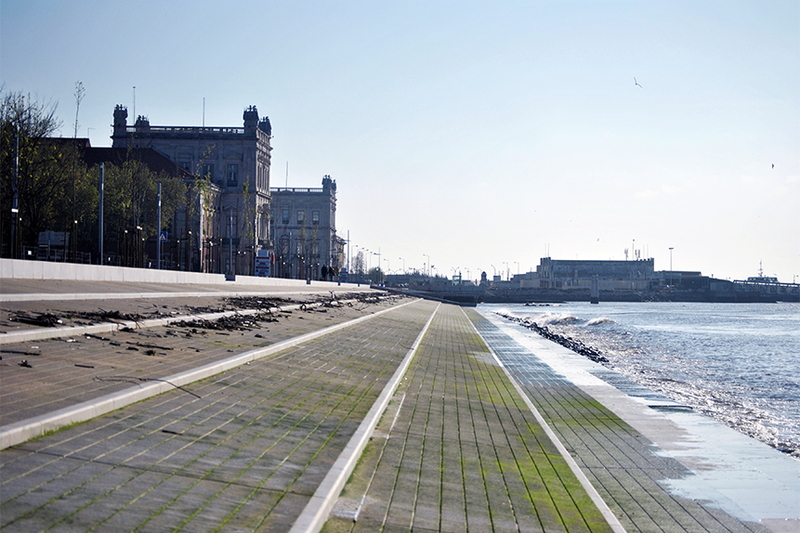 It is from this tension between the various present elements (built condition, dry dock) and the various strata, geometrically negatively related to the current quota surface (Arsenal dock, beaching walls), that the proposed design has been configured. 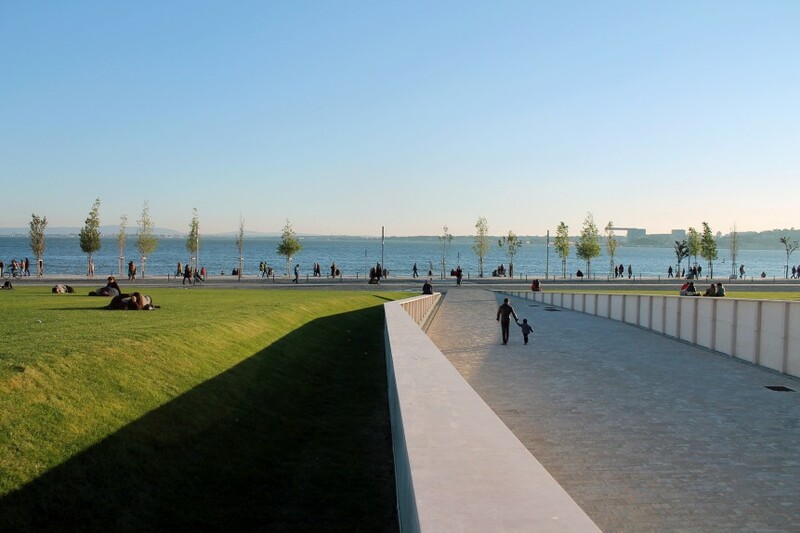 The revelation and integration of these fossil elements, partially buried and potentially determining the space’s nature, constituted the process of recreating the Ribeira das Naus, and so the redesign of the Lisbon waterfront. 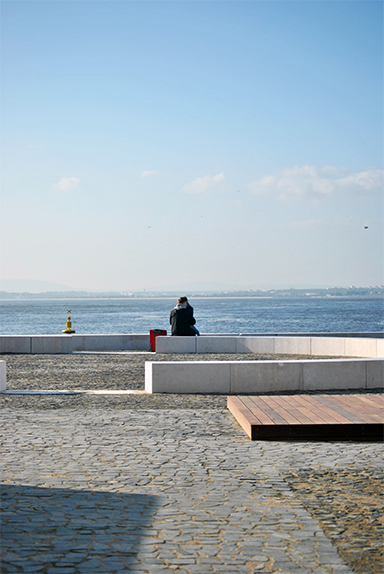 The architectural landscape of this Lisbon bank space consists then in the contrast between fossil elements and contemporary elements, with the double meaning of the revelation of the several ages of the same place (culture of city space) and with the action of the public space usage (circulation, permanence, contemplation, infrastructure). 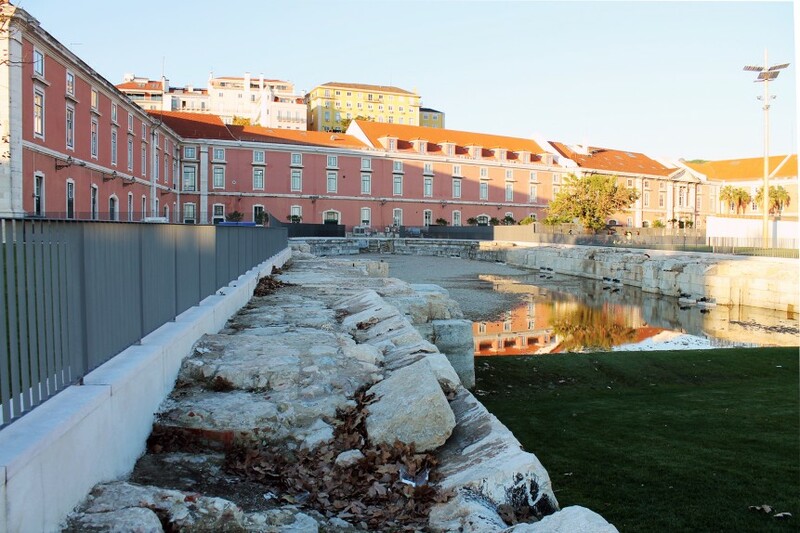 But if the revelation of juxtaposed temporal strata in this space seems to be a unique opportunity to create a vibrant place in Lisbon, which existential experience can it provide us? 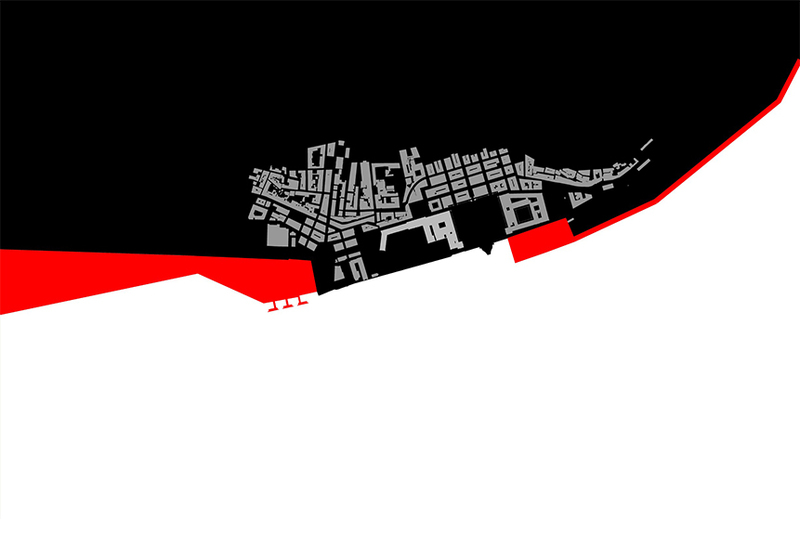 Norberg-Schulz tells us about the material and spatial character of a place, as determinative of its identity. 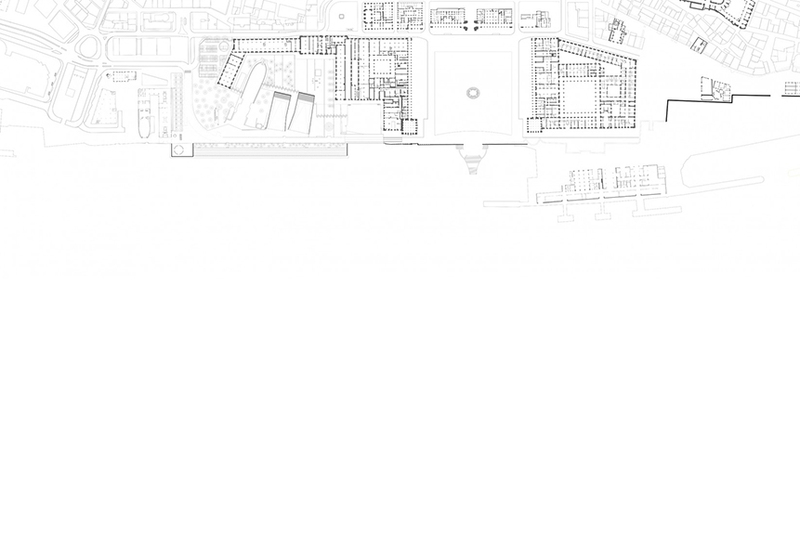 The work done on the Ribeira das Naus presents a radical option to cut out the coastline on the Arsenal Dock site tangential to the west Torreão, and so accurately determining a new margin alignment to Cais do Sodré, reconfiguring the coastline with a complete design. 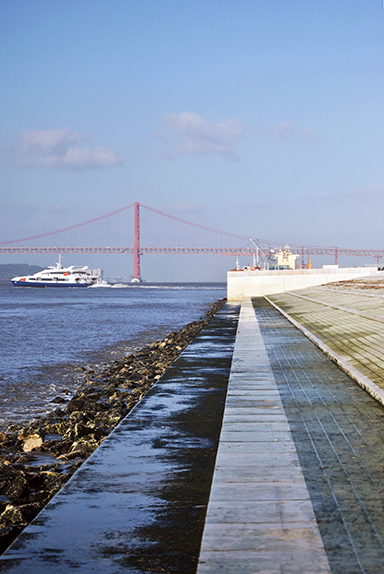 The Torreão will appear mirrored in the new water line that separates the platform from the Ribeira das Naus. 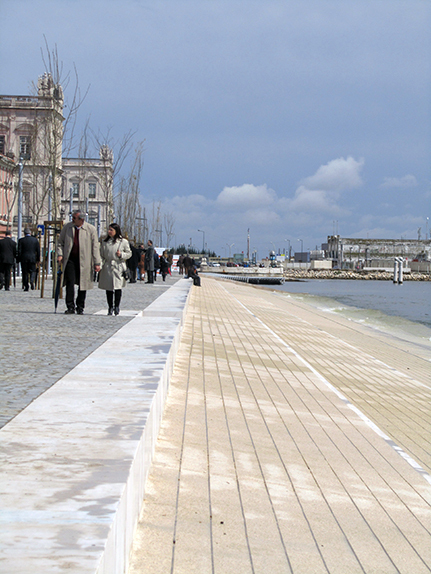 This platform, which contains the Doca seca (dry dock) artefact now fully exposed, reveals two new descending planes till the Tejo river, which materialize the place of beaching ramps now flat surfaces appropriated by grass and contemplative timber. 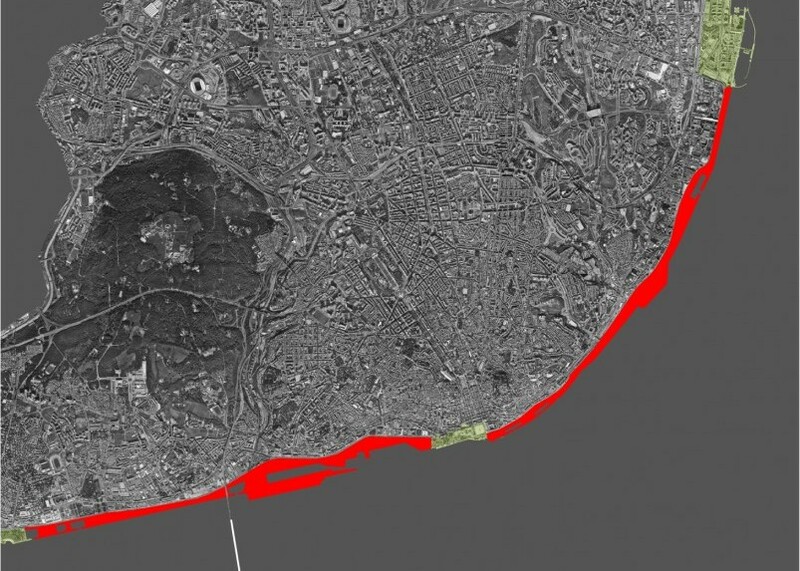 The original limit of the coastline is implemented and materialized by extensive black and basaltic surface that signifies the increased margin surface. 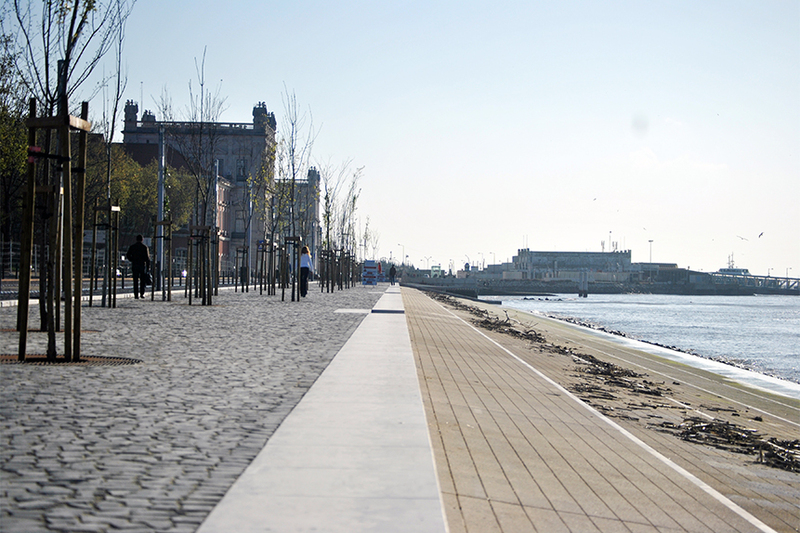 Upon reaching the marginal alignment, stony slopes gently slide as an artificial beach contained by the two pontoons. 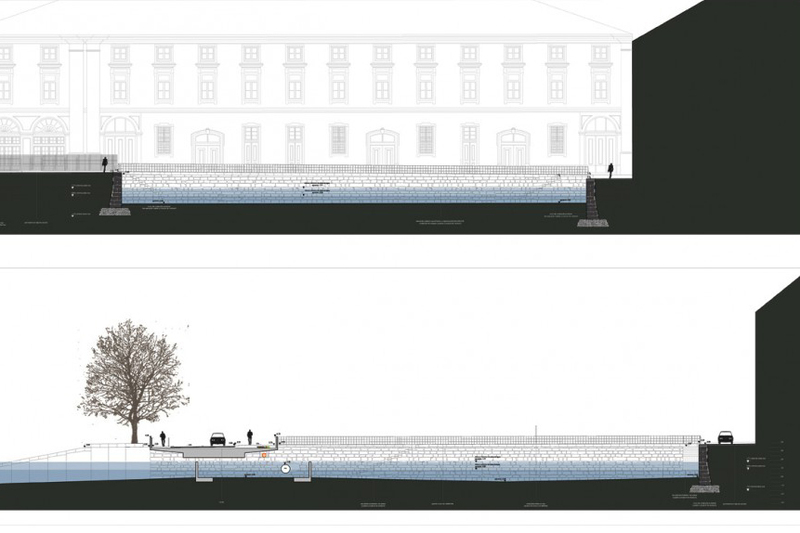 One, at east side, extends the lateral wall of the Arsenal dock, while the other to the west, extends the empty space of the Corpo Santo square, determining by opposition the mass of alignments of trees stretching along the River. In this black surface that absorbs us, runs the traffic of vehicles, bicycles and pedestrians, separated by signs of stone or wood that define directions, passageway, or shared surfaces. 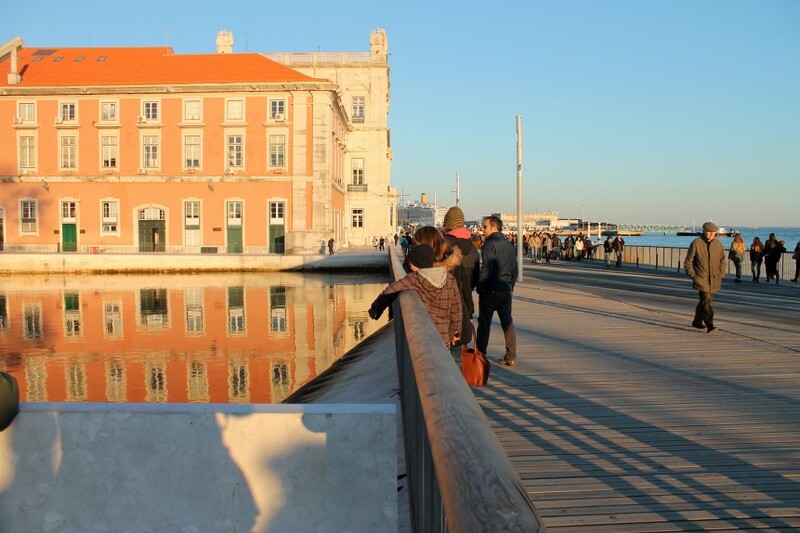 The access between the Ribeira das Naus and Praça do Comércio is now marked as if by a ritual of crossing the water, a bridge. Made of metal and wood with their own transparency, the bridge allows us to look down and admire the water, the old stone walls embedded in the tidal dyke which hosts the huge pipes that coincide at different heights, some exposed and suspended in the bridge structure itself. The delicacy of the new urban articulation demonstrates the clear difference between the two brother spaces that make us signify the Power and Industrial space in different form, now delivered to our daily or occasional rituals, individual or common. The light invades the various spaces, runs across them in different ways throughout days and years, distributing tree shadows, reflections or planes of intense or very soft light, enveloping us in much more than the simple daily crossing. 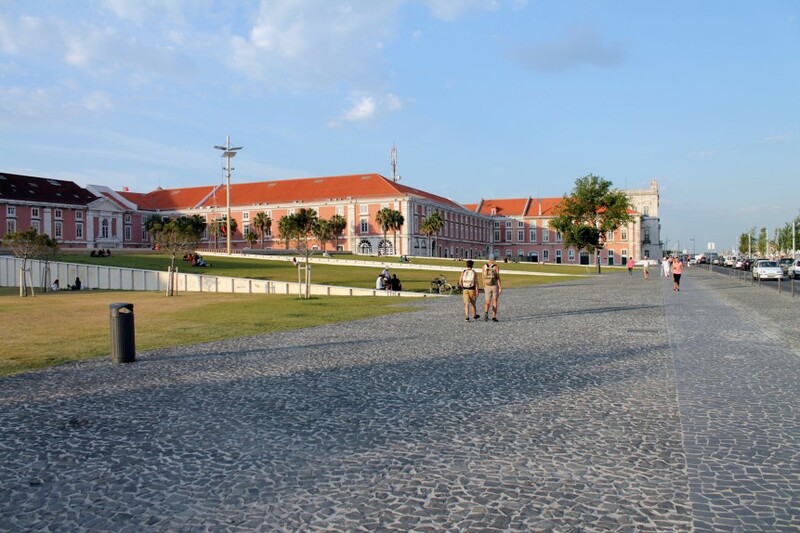 We imagine that we could now descend on the river, or even walk on the beach the tides cyclically reveal, till going up the staircase between the columns, and to suddenly encounter the monumental square of Praça do Comercio with its Castle raised up against the sky.